Here we have footage of what went down on Saturday 25th June 2011 at The Old Blue Last for Kozzie‘s launch party in aid of ‘The Problem’s Started’ mix CD which is OUT NOW! So click the pic to purchase your copy. Hang tight Ardwear TV for the footage. Big up Kozzie, Merky Ace, Ego, Shif Man, Rival, Jammin, Discarda, Jammer, Drifter, Infa, RD & Careless on mic and myself Spooky on deck flinging down the sounds spraying quick-fire rounds. 8:12 Royal T – Damn It! So let’s get ’em out there! then I’m at Kozzie’s The Problem’s Started launch party on Saturday 25th June @ The Old Blue Last, Shoreditch, East London (and it’s FREE ENTRY)…. DONT FORGET TO BUY KOZZIE – ‘THE PROBLEM’S STARTED’ OUT MONDAY 27TH JUNE! 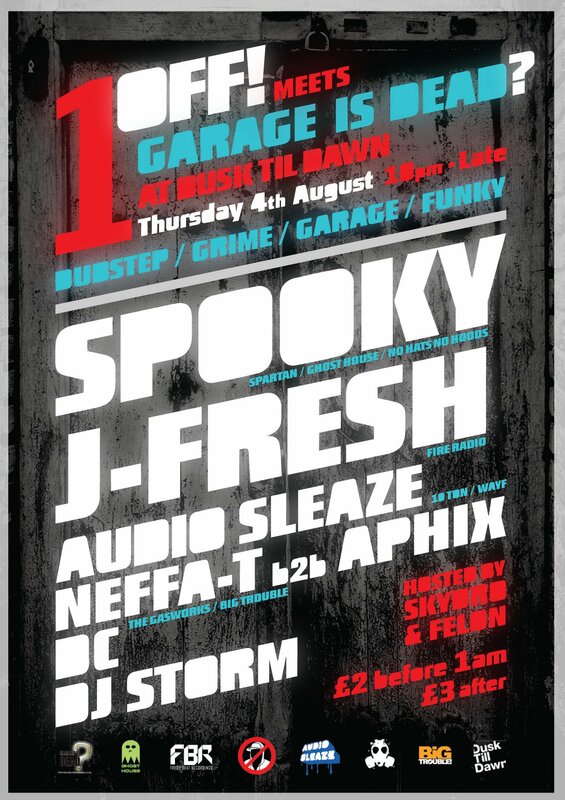 Then catch me down at The Jailhouse in Hereford on Friday 15th July alongside Tomb Crew…. Then im down the Blue Mountain in Bristol for Looney Tunes on Saturday 16th July alongside Royal-T…. Last but not least… catch me down Garage Is Dead? @ Dusk Till Dawn in Bournemouth on Thursday 4th August! Until then… catch me if you can! Right. Here is just one of a few bookings that I got in the next few months. Alongside myself Spooky you will have Marger & M.I.K. The age limit for this one is over 14s so you will need to get down here! Big up John Halifax. Safe! Click the pics for the Facebook event page. Keep an eye on my blog for more bookings and places where you can find me. In the meantime… take it easy! Don’t ask why I didn’t blog this any sooner. But here we go. 4 outlawed bootlegs all in 1 nice little zip folder with a bonus track thrown in for good measure and you have ‘A Bag Of Myths’ from Spooky. CLICK HERE OR THE PIC FOR THE DOWNLOAD! This is me taking a look back at some of the biggest 8 & 16 bar tunes of the grime era. Did this mix way back in January 2009 for the Grime Podcast. Had over 9,000 hits since it’s been up. Thought I’d blog it here as well. Sticky feat. Ms Dynamite – Booo! Platinum 45 feat. More Fire Crew – Oi! Click here to listen to the mix or click here to download the mix.